I am very tempted to buy a pair of Apple AirPods. Even if I am an Android user. 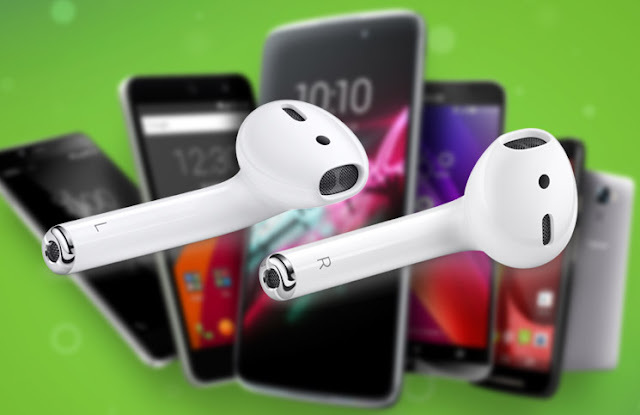 You can still pair them with an Android phone as normal Bluetooth headphones, and you can double tap on them to Pause/Play the audio you listening to. Of course, Siri doesn’t work, but that doesn’t matter for me because I don’t like Siri and never use it anyway. They don’t automatically pause the audio when you take one of them out, though. That’s too bad because that would be quite useful. But I could connect it to my iPhone SE so I can use my Apple Watch as a remote. But I never use my iPhone for listening to books or podcasts, so that would be quite pointless. The only reason to do that for me would be to have an easy way to see how much battery left there is in both the AirPods itself and the charging case. You get a nice widget for that on the iPhone and I can glance at my Apple Watch to see how much battery left it is, even if I use them together with my Android phone. The reason why I am tempted to buy a pair of AIrPods is that I really like how comfortable they feel while using them. At least that is what the wired EarPods feels. I can easily use the wired EarPods all day without even notice they are in my ears. So it would be even better with the AirPods because they don’t have any cables at all. I have a lot of wireless in-ear headphones, but the rubber plugs on all of them always start to irritate my ears after a while. The only plugs I can use for a longer time is Apple’s EarPods. So I think the AirPods would be perfect for me even if I am an Android user. And I get the really cool and useful charging case with them, that removes the hassle with charging them completely. The battery life is definitely not a problem with the AirPods, all thanks to the useful charging case. I think Apple’s true wireless AirPods headphones are worth its price.